Hank discusses the arrangement of the atoms in crystalline solids and how their atomic arrangement differs from amorphous solids. 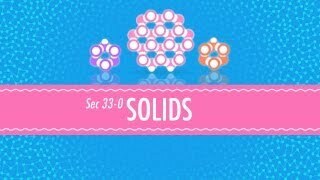 He mentions that each category of solid's atomic arrangement affects its properties, from how it breaks to its appearance. He also describes a couple of types crystalline solids: ionic and molecular.